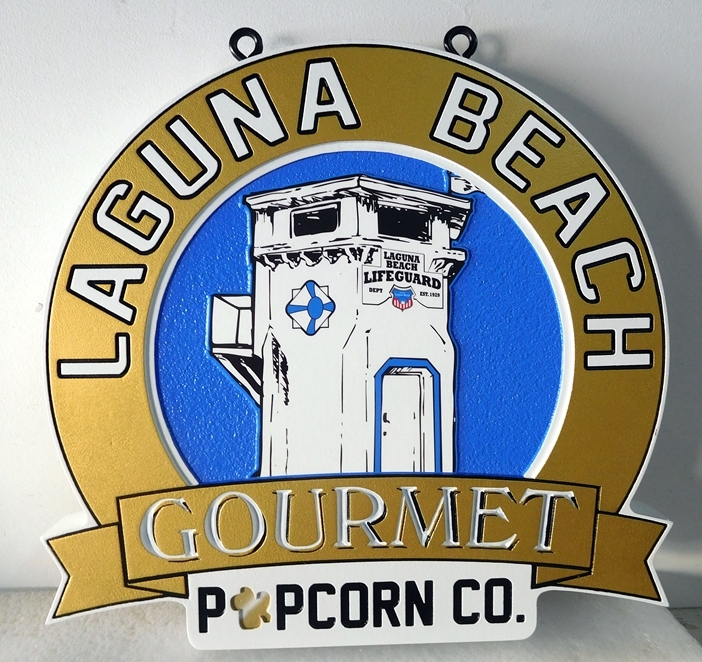 This sign for the Laguna Beach Popcorn Company is carved and engraved from High Density Urethane. It features both raised and engraved text . The artwork has engraved/recessed outlines and painted areas on the front smooth surface. The blue background is sandblasted in a sandstone texture. The sign has been painted with long-lasting automotive-grade enamels and clear-coated twice, making it suitable for outdoor use in a marine climate. The sign can be hung from o one of our wrought iron scroll brackets (see Product Line 4) or a ceiling beam, or mounted on a wall or an outside door.